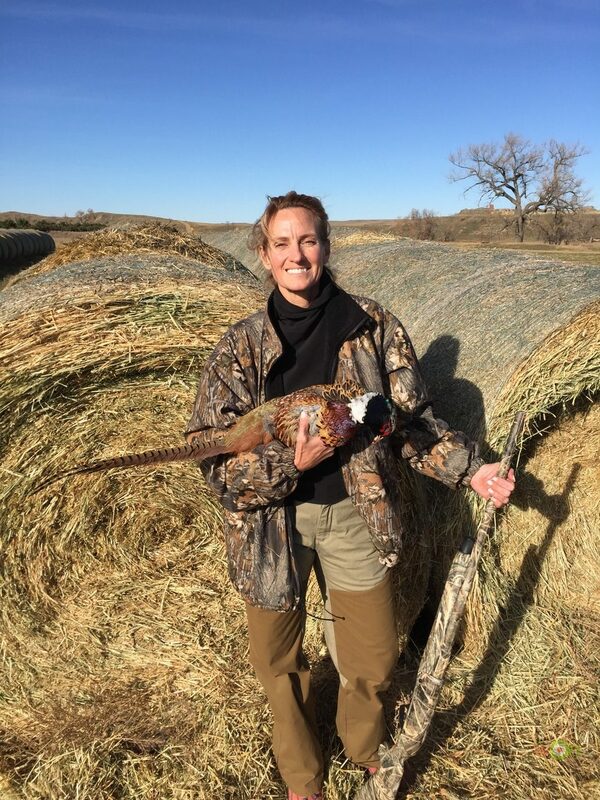 Cynthia Kruger joined the Syren ProStaff team and quickly decided she wanted to also be a dealer. 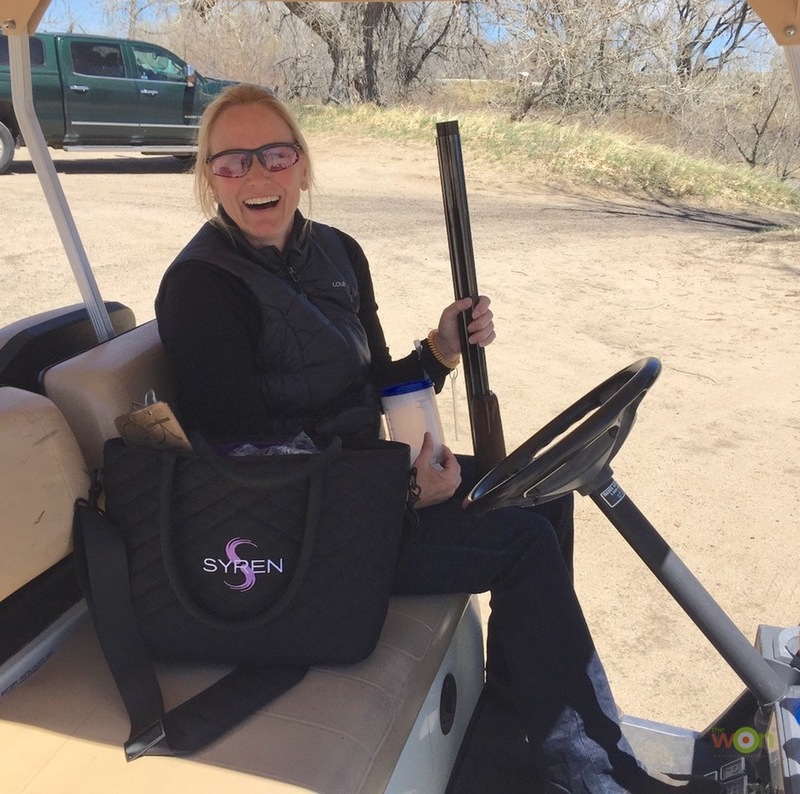 With her welcoming personality and experience in the shooting sports, she was an ideal new Syren dealer and I am continuing to expect great things from her. I wish I had a dozen more just like her. LG: What did you do before you were a Syren dealer? CK: My past career was in advertising and marketing. I started as an art director based in Paris, France, and ended as an executive producer and director of broadcast radio and music production for DDB Needham Chicago. Currently, I work with my family’s commercial real estate company and am a Syren gun dealer. LG: How did you get involved with shooting shotguns Where are some of the fun places you’ve traveled and how many years were you an All American? CK: I first shot a shotgun in my late 30s. I went for a weekend bird hunting trip and we shot sporting clays as a warm-up. I loved shooting instantly and went hunting or sport shooting any chance I had. It was hard to find friends that were as avid shooters as I was, so I joined a local gun club on my own and started travelling nationally to shoots on my own also. I met and made a lot of good friends along the way. My favorite travel year was when the World FITASC Championships were held in Australia and then went to Italy at the end of the year. I also enjoyed traveling to Dubai and the Invitational that was held there. I was an All-American from 2010 to 2016 in both Sporting Clays and FITASC. I’ve been an All American in 12, 20 and 28 gauge. LG: How did you meet your husband, Jon? CK: I met Jon Kruger at the first shoot I ever went to. I didn’t know many people or anything about tournaments or pros, so when I shot in Jon’s squad, I wasn’t fazed by him like the other shooters were. We became good friends because of that. I would see him over the years at shoots and at some point we decided to be a couple. We’ve been married since 2010 and live in Franktown, Colorado. LG: When/How did you decide you wanted/could be a gun dealer? 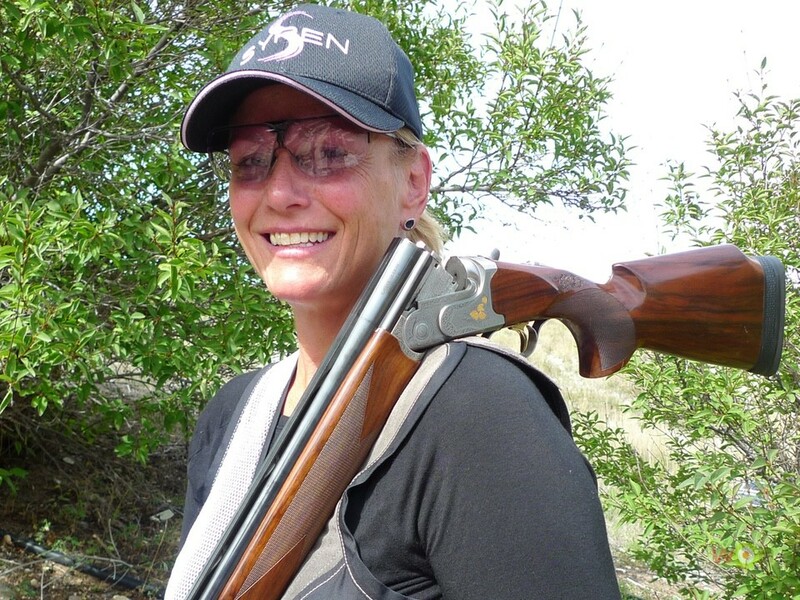 CK: I knew from the start that being both a Syren ProStaff competitive shooter and a Syren dealer, I’d have the opportunity to engage the competition world and the recreational world of shotgun sports. I meet so many women who love to shoot clay targets and to hunt. As a dealer, I know our brand very well and can tailor the gun to the activity since we have sporting, hunting/field, trap and also a camouflage model. Fortunately, I have a lot more control over customer service and after-sale care that includes free instruction to ensure that clients are handling their Syrens well and it’s the perfect fit for them. I am dedicated to the brand and love to put the guns in the hands of lady shooters. I never doubted I could be a gun dealer because I didn’t really know what it entailed. That’s typical of starting any business. You can’t plan for everything. The first year was a steep learning curve, and this second year is much easier, although the learning never stops. LG: How did Syren appeal to you as the brand and company you wanted to sell for? CK: I have shot a number of shotgun brands – all of which are designed and built for a man. When I started shooting the Syren Tempio 12 gauge, I was amazed. The Syrens are designed for women. Not altered or cut down or painted pink, but really designed for a woman. The main benefit is the reach/pistol grip/forend and length-of-pull out of the box. It is compact and the guns are balanced well between the hands. The weight of the stock is balanced to the barrel, so it’s easy to move and swing. The forcing cones mitigate recoil, so the lighter weight doesn’t knock you around as it can in other guns. The Monte Carlo comb slightly lifts the typically longer neck and smaller face and positions the eye right down the barrel. The quality of Syren is fantastic and the range of guns available is unparalleled. They are priced well for all budgets. Having worked with other gun companies, I respect Caesar Guerini/Fabarm/Syren for the quality of the product, the innovation of design and the fantastic customer service. Syren is an industry innovation that stands out. LG: What were your biggest challenges and victories you experienced this past year? CK: My biggest challenge and victory was figuring out who to work with and who not to work with. I have now developed a network of industry people who share my values of customer service. LG: How important do you think having demo guns for the ladies to shoot is? Has it helped with your sales? CK: I think it’s so important that I’ve purchased an array of demo guns and am an authorized Syren Demo Center and based at Kiowa Creek just outside of Denver, Colorado. It makes all the difference to buyers when they can shoot a gun before purchasing, and that isn’t a typical option in retail gun sales. With the demo guns, I can shoot with the buyers and make small corrections in gun mounts and stances that help them to shoot successfully and will show me actual gun fits. Many sales are made because I have demo guns and because I am willing to travel with them to the buyers when necessary. LG: Tell me about your customer appreciation gifts and the party you hosted for the new gun owners. CK: I prepare a small purple cooler and put a box of low recoil shells, a Syren accessory, a Syren web-store gift card and a random funny thing – such as a pair of socks with a girl-centric graphic, or a water bottle. Something to say thank-you for the purchase. I host an annual shooting party at my home club and invite my Syren clients and other lady shooters – who may be clients some day – for a few hours of shooting and socializing. It has been my experience that women have more fun when they meet other women in the industry. LG: I know how much the ladies that I do demos with energize me when I take them shooting … what’s been your biggest satisfaction with this new career as a gun dealer? CK: I like to say these days that I’m just a girl who likes to shoot and sell guns to other girls. There are a lot of different ways to enjoy shooting a shotgun. I’m learning to have more fun and enjoy competing while helping to make other ladies strong in their shooting. I get to spend a lot of time in the company of really cool women! LG: What events are you planning on doing this year? 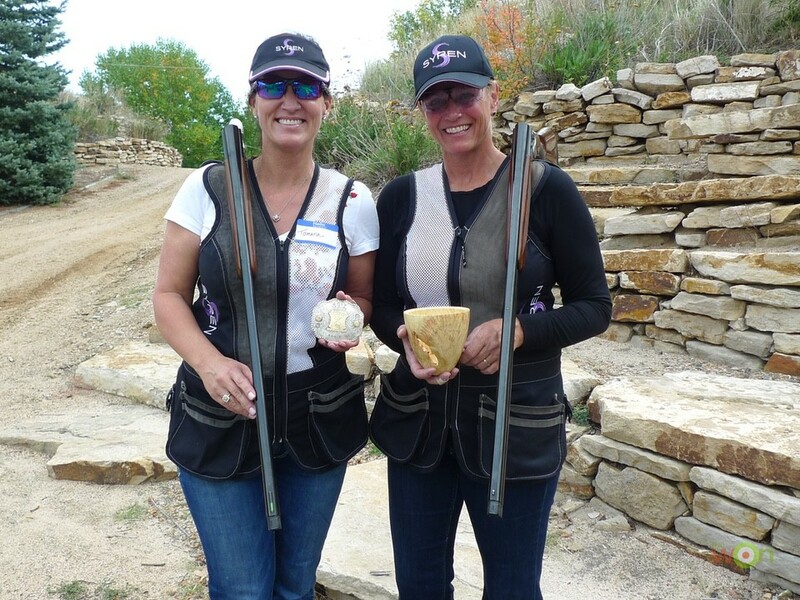 As a Syren dealer I am sponsoring the Lady HOA prize of a new L4S Semi-Auto 12g for the Buffalo Bill Charity Shoot in Cody Wyoming and hosting a Syren Demo Day. I am a Syren dealer station sponsor for the annual Merry Miracles Shoot for Children’s Hospital. I am a Syren dealer sponsor for the Boy Scouts Denver Area council annual charity shoot. My husband and I will be introducing Sporting Clays to the events at the Colorado Adaptive Sports Foundation Charity Fundraiser in August and hosting a Syren Demo Day. 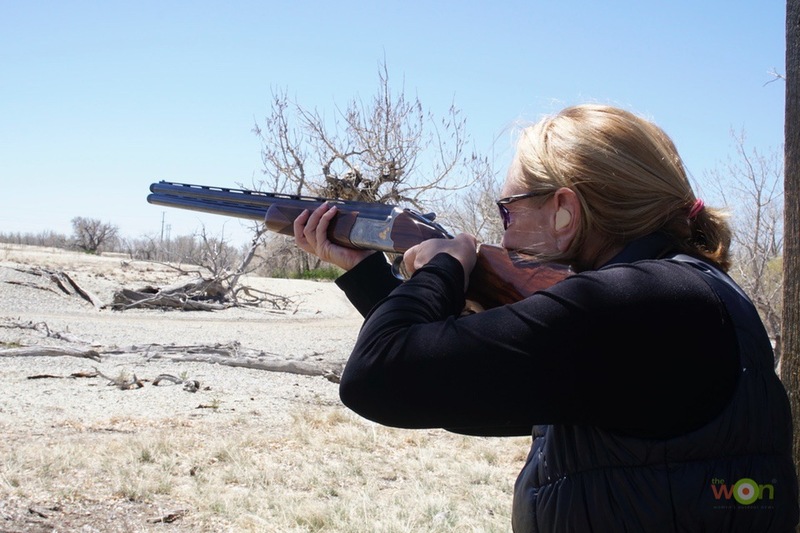 I have a monthly shotgun clinic for Women Who Hunt to be held at Colorado Clays starting in March. I am hosting a Syren Bling Day with 2 lady jewelry designers I know. We will shoot Syrens and browse bling. I am hosting my annual Syren Appreciation Shoot in the fall. I am attending large shoots such as the US OPEN in Tucson, Arizona, in April and the Kansas State Shoot in summer as a Syren ProStaff shooter. LG: What’s your advice on ladies getting out to shoot for the first time – or as beginners? CK: Shooting for the first time, you’ll either love it or hate it. If you love it, you’ll want to do it again. At this point I recommend getting a neutral instructor – not a relative – to go over the basics with you: stance, mount, gun fit, ammo and what you’re shooting at. Make sure you like your instructor and are made to feel that there’s no such thing as a dumb question. If you don’t get answers to your questions that help you makes sense of this complicated activity, then find another instructor. With a good understanding of the basics, you can have a lot more fun and success. Meet other Syren ProStaffers like Syren dealer Cynthia Kruger here.